Yesterday I wrote about some of my favorite illustrators and prints, today I am sharing some tips on how to hang that artwork in a young child's environment. Here are some of my tips and what has worked for us. Hang artwork within the child's line of sight. For an infant's room I would put some artwork that is easily removable (possibly black and white/high contrast) at their level (lying down or for tummy time) but also some artwork that they will be able to look up and see when they are sitting or even standing. I would not put artwork higher than the child could see when they pull to stand, at or around nine to twelve months. This applies to their room, which belongs to them. Imagine how frustrating it would be to know there is beautiful artwork hanging on your wall and getting glimpses but not being able to see it clearly. To create a sense of calm. Can assist with visual perception. Can assist with vocabulary, as the child points and begins to name things in their environment. To express love, when we love a child we create an environment for the child, that is developmentally and culturally appropriate. When the images are life-like or of known objects they can assist the child learn about the world around them. Artwork from siblings, family, and friends. Pages from magazines (think National Geographic), calendars or old books. Post Cards, note or gift cards, beautiful flash cards. Printed from free images online. Art possibly framed from thrift stores, garage sales, school art festivals. Before the child can crawl, artwork can be attached to the wall with some simple blutac or something removable, however, once the child can crawl and is able to pull the artwork off the wall you want it more firmly attached. It's a good idea to have the artwork firmly attached before the child can reach it, once the child has learned the artwork will come off the wall they may keep on trying to remove it, it's best not to get to that stage. The child's room needs to be 100% child safe, especially if you are using a floor bed. I have avoided using glass in the frames. Our local framer will cut perspex to size (to put in the frame) and I've ordered frames online that come with perspex as an option, which are also much lighter. Alternatively remove the glass from the frame completely. If you need to strengthen the image or want the child to be able to touch it, the image could be laminated prior to going into the frame. I have seen many images laminated and put on children's walls without framing, which works and can look really simple and beautiful. Some flashcards and the Bits of Intelligence Cards that we love, are a thick coated card, these can easily go into a frame without glass. I am also thinking of getting some of our artwork block mounted for our new Montessori nursery, I've done this previously with one of the boy's posters and it came out fantastic. Once block mounted the image could go directly on the wall, it removes the distraction of the frame and looks more streamlined! I've never had a problem with my two children removing the images from the wall. I don't know if this is because they never found out they could come off the wall or if they never tried! For all of our images I have used the 3M Command Velcro Strips. They are removable and have worked really well for us. I use a lot of them to make sure the image and frame are really secure. 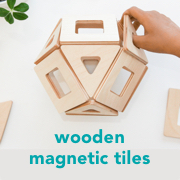 In this beautiful Montessori nursery Meg notes that she has screwed the frames to the wall, which is a good option if you are happy to repair the wall afterwards. Above Otis is 7 months old, he can see the artwork and it gives him an incentive to move towards his shelves to start pulling up, when he eventually does come to standing, he is directly in front of and can clearly see and focus on the artwork. Beautiful and simple environment above with low hanging artwork at Three Oaks Blog. You can see how much the artwork contributes to this space! 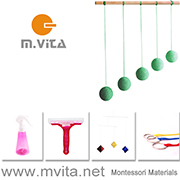 Michael Olaf (US) supplies frames (similar to that above) designed specifically for low hanging artwork in Montessori environments.